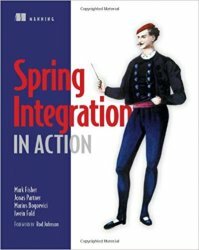 Spring Integration extends the Spring Framework to support the patterns described in Gregor Hohpe and Bobby Woolf's Enterprise Integration Patterns (Addison Wesley, 2003). Like the Spring Framework itself, it focuses on developer productivity, making it easier to build, test, and maintain enterprise integration solutions. Spring Integration in Action is an introduction and guide to enterprise integration and messaging using the Spring Integration framework. The book starts off by reviewing core messaging patterns, such as those used in transformation and routing. It then drills down into real-world enterprise integration scenarios using JMS, web services, filesystems, email, and more. You'll find an emphasis on testing, along with practical coverage of topics like concurrency, scheduling, system management, and monitoring.